For major software projects, the road to release is oftentimes a rocky one. Hidden challenges and obstacles can transform a straightforward project into a bloated initiative that has overrun its anticipated expense and schedule—racking up expenses while running the forecasted ROI into the ground. Software failures like these can lead to poor-quality releases, project cancellations, reductions in scale, and even company bankruptcies in extreme circumstances. What’s the cause of these losses? The 3 Perils of Software DevelopmentTM—Defects, Delays, and Dollars. In this white paper, you’ll learn what causes them, what problems they cause, and—most importantly—what you can do to avoid them. 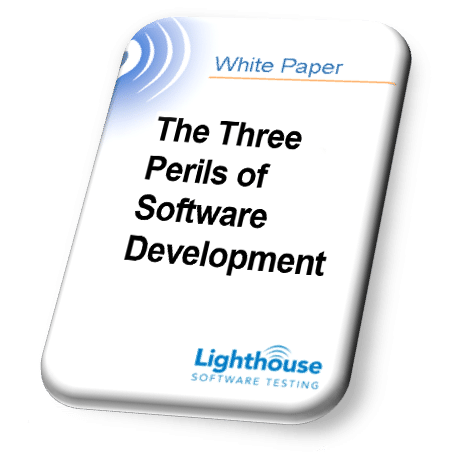 Fill out the form to get your FREE copy of our White Paper: The Three Perils of Software Development.